After a few weeks break I am back on track with this stitch challenge. This stitch challenge is posted by Queenie on her blog. These stitches are stitches which are simple [till now] and did not feature in TAST challenges. The working of four sided stitch is here. This is a counted thread stitch but can also be worked on plain fabric with some practice. A nice variation from cross stitch. 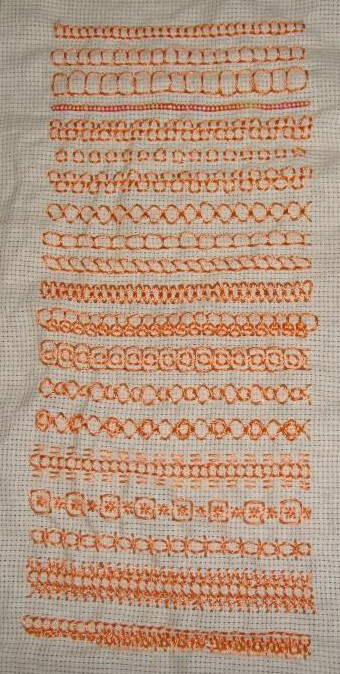 This sampler started with the four sided stitches are worked over 3 holes, four holes, five holes and two holes, in that order. The sample worked over two holes is stitched with anchor cotton skein. Rest of the samples are worked in polyester thread. I changed the direction of the stitch in the first sample, worked individual stitches in the second sample, an up and down version in the third sample and the diagonal version worked horizontal in the fourth sample. Since it is called four sided stitch and not square stitch, it became obligatory to work this stitch- as rectangles in first sample, angling the stitches to the left in the second sample and ablong diamonds in the third sample. After working these samples, fearing, working in this direction might lead to black work patterns and stopped right there. Two versions of four sided stitches are worked together in these samples. The four sided stitch worked over four holes is combined with four sided stitch worked over three holes in the first sample. Individual four sided stitches are worked inside four sided stitch worked over five holes in the second sample. Diagonal four sided stitches and basic four sided stitches are alternatively worked in the third sample. 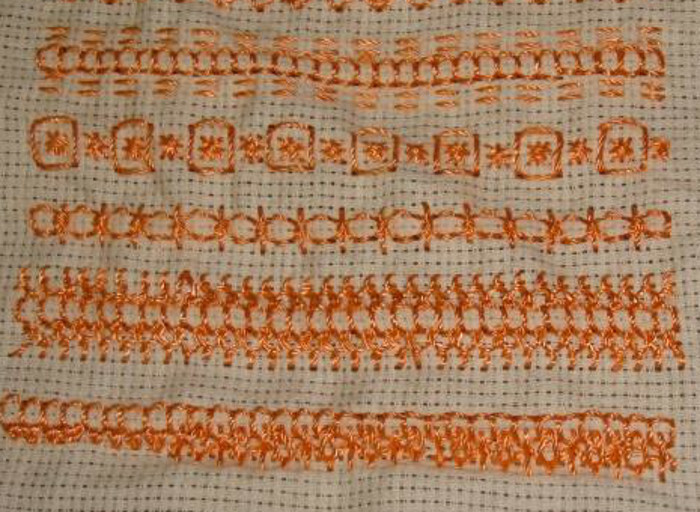 Individual stitches are worked inside alternative diagonal four sided stitches in the fourth sample. Now for some stitch combinations. Four sided stitch row worked with running stitch rows in the first sample. Double cross stitches are combined with this stitch in the second row [other isolated stitches can also be tried in this manner]. After working single long straight stitches in between these four sided stitches, sheaf stitches are used to tie and link them together in the third sample. It started with the idea of combining buttonhole stitches with four sided stitches in the fourth row, but ended up with combining cretan stitches. In the last sample, Danish knots, detached chain stitches and individual fly stitches are worked on four sided stitch row. This after noon we went to the park [where we take a walk in the evenings] and sat on a bench. This was our view. The stitch combinations were started at home and completed sitting on the bench. Time well spent. Very enjoyable hour. 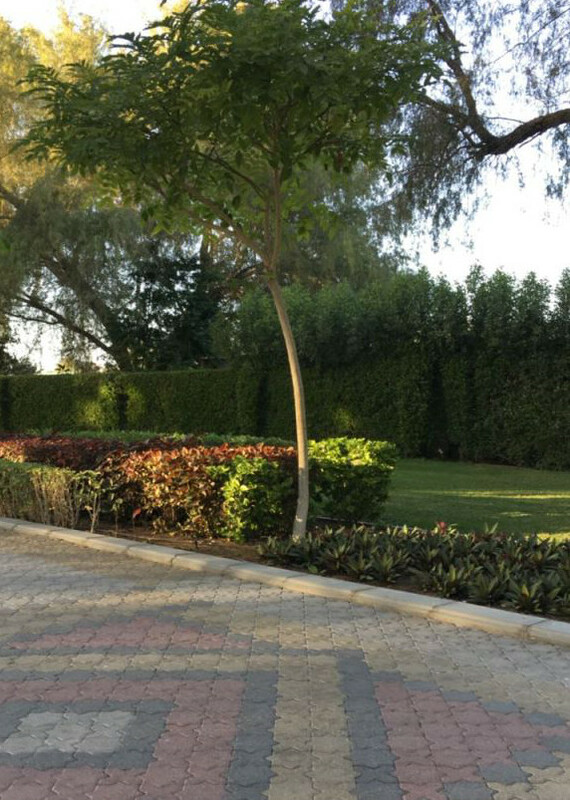 It is pleasantly cool in Muscat now.